June first happens to be holy Sannyasa anniversary day of the most worshipful and revered Sadguru Shri Swami Sivanandji Maharaj. A special satsang were held at the Ashram. On June 3, 2006 Rev. 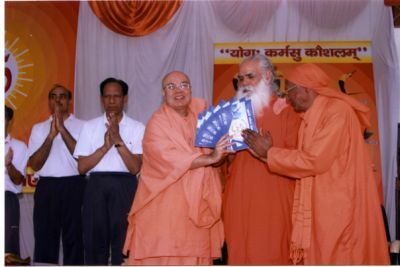 Swamiji went to Yamuna Nagar for a grand gathering of senior citizen congregation.On June 4, 2006 Swamiji attended a big gathering of Children's personality development program, jointly organized by “Karan Yoga Kendra” and“Nirmal Sadhana Ashram”.From Yamuna Nagar Swamiji arrived at Pachkula by noon and addressed Vedanta Samelan. Mrs Kakly and Mr Ashish Gupta were the chief organizers of this function. From here the Swamiji had a quick drive to Chandigarh for the satsang and house warming function of Mrs. Nirmal Bhatia and Mr Dharamveer Bhatia (IAS). Swamiji paid a special visit to Ludhiana and attended “Jain Samagam” organised by Shri Rajkumar Jain and Acharya Maharaj of Samagam. 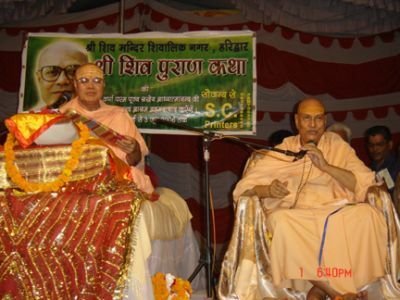 Farewell function for Swami Adhyatmanandaji Maharaj ( June 8, 2006). 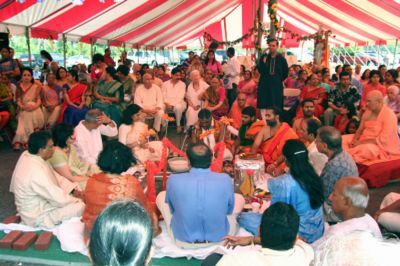 On June 8, 2006 devotees gathered at the ashram to wish Swamiji before his departure on His “Divya Tour 2006” to the West including USA, Canada & Europe. Swamiji proceeded to airport at 12.00 am, a big crowd of devotees also accompanied Swamiji at the airport over ruling his request. Once again prayer was offered for his safe journey by all gathered at Sardar Vallabhbhai Patel International Airport, Ahmedabad. With great enthusiasm and festive mood devotees in large numbers gathered at the ashram to celebrate a special occasion of Rath Yatra of Lord Jagannath on June 27, 2006, The Idols of Lord Sri Jagannath, brother Balaramji & sister Subhadraji were adorned splendidly after ceremoniously worshipped by temple priest, Then the idols were placed in decorated chariot and brought out for the procession. It was a joyous occasion for all. Devotees were singing and dancing in the praise of the Lord. It was thrilling sight to be seen. The ashram was charged with divine vibrations. The Vedic scriptures state that anyone who sees Lord Jagannatha or pulls His chariots achieves immense spiritual benefit. By His supreme potency, the Supreme Lord agrees to personally enter the form of Deity, just to accept the loving service of His devotees. In this sense the Deity is non-different from the Lord Himself. And once a year Lord Jagannatha comes forth in all His magnificent splendor to enjoy the Ratha-yatra parade and show Himself to all. 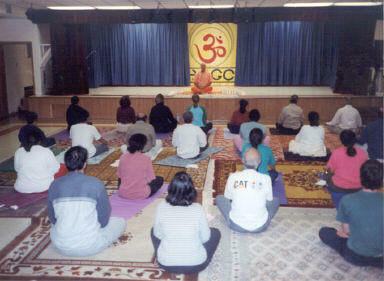 June 1, 2006 to June 10, 2006 Regular basic yoga session was conducted by Sri Snehal Amin. On June 6, 2006 Swamiji attended satsang at Yogi Ankur's & Desai's home on the occasion of their new house warming. Yoga Symposium was held for Industrial corporate officers by Yoga teachers of the Ashram. Sanggeta Thawani took initiative in arranging it. Grains were distributed to poor and need families as always in the month of June 2006. 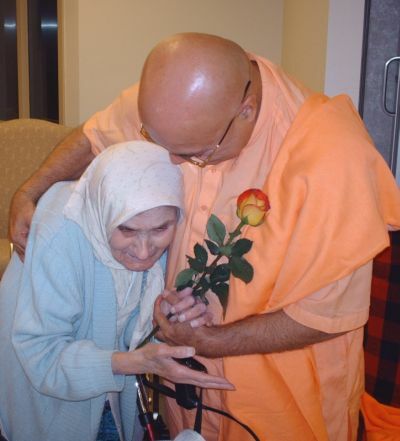 On June 25, 2004 Swamiji arrived at late night to Windsor. A wonderful satsang was organized at the temple in Windsor. Sri Jayesh Patel needs special thanks for his share in arranging this satsang. On Sunday 25, Rev. 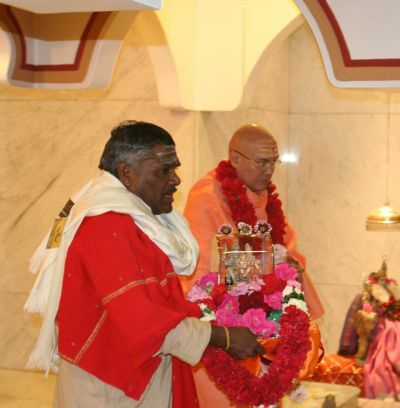 Swamiji arrived at the Hindu Temple of Toledo, Ohio for his spiritual retreat in the forenoon. During his stay here, he conducted a special yoga symposium and workshop in the morning. People from diverse nations and cultures attended these classes. Young, old and children from all walks of life participated in these yoga classes enthusiastically. In the evening, he shared his spark of knowledge upon the subject of Glory of Shri Vishnu Sahasranama. Chief priest & Acharya of the temple Pandit Shri Anantdixitji and Smt Binduben Mistry organized the entire program in Toledo. They deserve a special thanks. 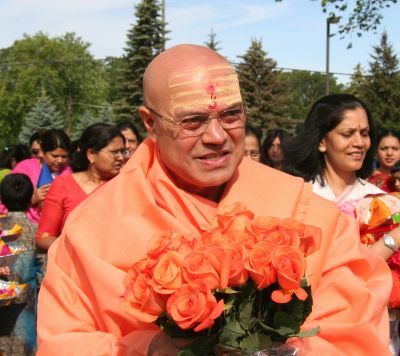 Swamiji proceeded to Chicago on Wednesday, June 28 late night. 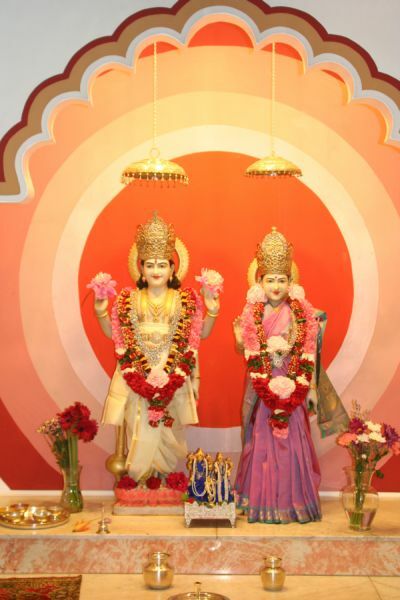 Hindu Temple of Greater Chicago hosted Rev. Swamiji’s seven days Yoga Camp in the morning from 6.00am to 7.30 am from Thursday, June 29 till July 5, 2006. Swamiji’s simple way of teaching Yoga attracted many to come from far and wide to attend the Yoga sessions early in the morning. It was attended by a large number of yoga enthusiasts including yoga teachers of all nationality. 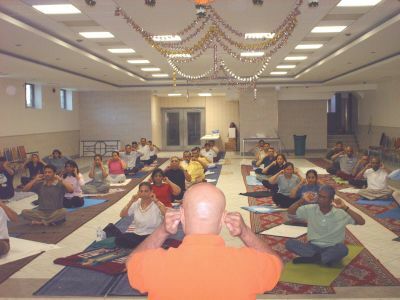 Swamiji taught preliminary flexibility exercises for the beginners and also taught advanced Yogasana postures, Pranayama including Sivananda Pranayama, Yoganidra, and Meditation techniques in detail at the request of others who are well advanced in the yoga field. The program was extremely well received and very much appreciated by all participants. Widely read “India Tribune” newspaper carried a press interview on Thursday afternoon of Pujya Swamiji and his mission of spreading the message of Holy Master Swami Sivanandaji Maharaj. 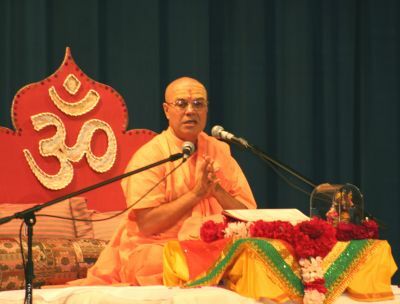 On Friday, June30th welcome satsang was arranged in the evening. 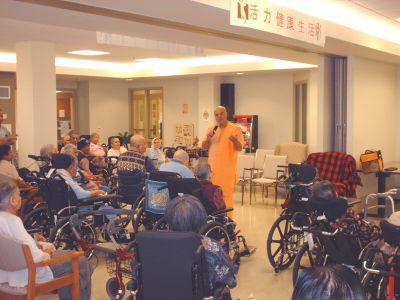 Swamiji stressed the importance of daily Sadhana and living virtuous life. Swamiji’s evening discourses were organized at various organizations namely, Hari Om Mandir, Sri. Gayatri Parivar, KP convention, Sri. 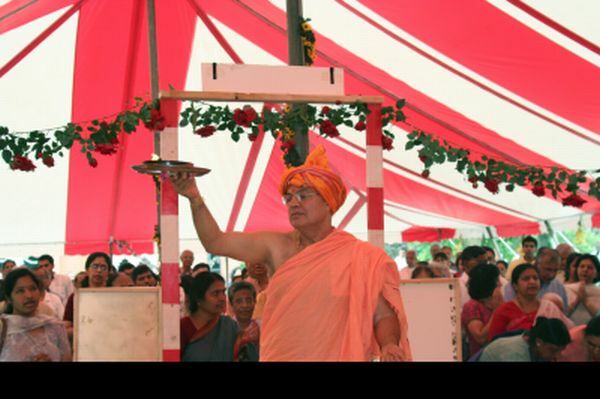 Arbindo Kendra, Northeastern University , Sri BAP's Swami Narayana Mandir and Hindu temple of Greater Chicago. All the program were very well attended. 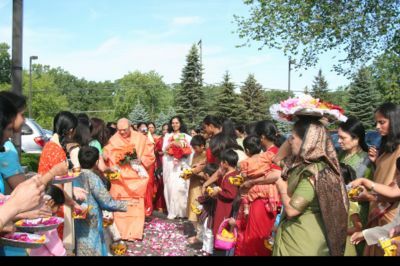 Swamiji stayed in Chicago up to the long weekend, America’s Independence day (July 4th) and Holy Mahasamadhi Day of the Most Worshipful and Revered great Son (Sun) of mother India His Holiness Swami Vivekanadaji Maharaj. 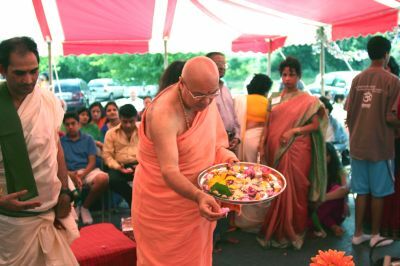 On July 4th Swamiji had a visit to Milwaukee and satsang at Sri Naveenbhai & Harshaben of Yogeshwar Parivar and Hari & Arpana's home. Swamiji’s one week stay here was completely filled and hectic with religious institutional programs, home visits & home satangs. The day began at 5.00am till 10.30 pm on most of the days. It's a challenge for the host to keep up with his energy level. 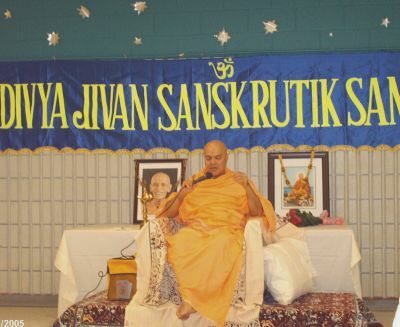 Then again Swamiji will proceeded to Canada for his “Divya Tour 2006” to Winnipeg.